“Materials and Perspective: Valley Cultura” is a collective of three Rio Grande Valley based artists, Corinne Whittemore, Aleida Garcia Wedgworth and Sara Garza. The exhibit features sculptural and wearable art by Aleida Garcia, painted memories by Sara Garza, and digital art comprised of fragmented photographs by Corinne Whittemore. Danielle López, a Mexican American Studies Scholartivista, added curandera-inspired performance art on the opening night. The basic concept of the show revolves around the memories of the artists. With different backgrounds, they have manifested visually what Valley culture has meant to each of them. For Wedgworth, it is multi-faceted and references the female experience. With sculpture about female emergence and jewelry-based art, she brings other facets of her experiences into this framework. 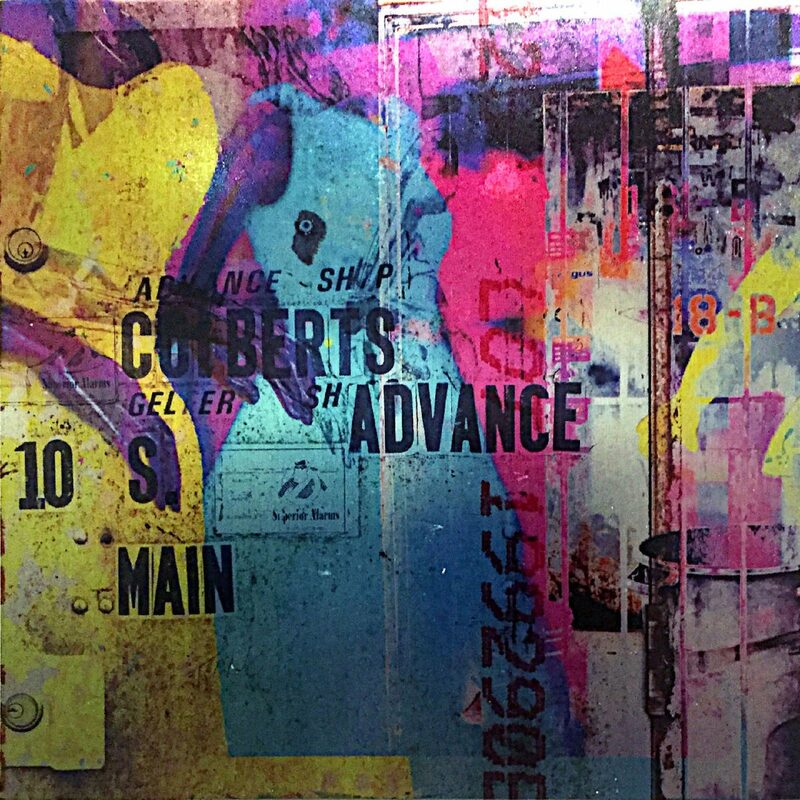 Whittemore is more about the urban environment, showing photo-montage prints screaming with vividly hued buildings and storefront identification. 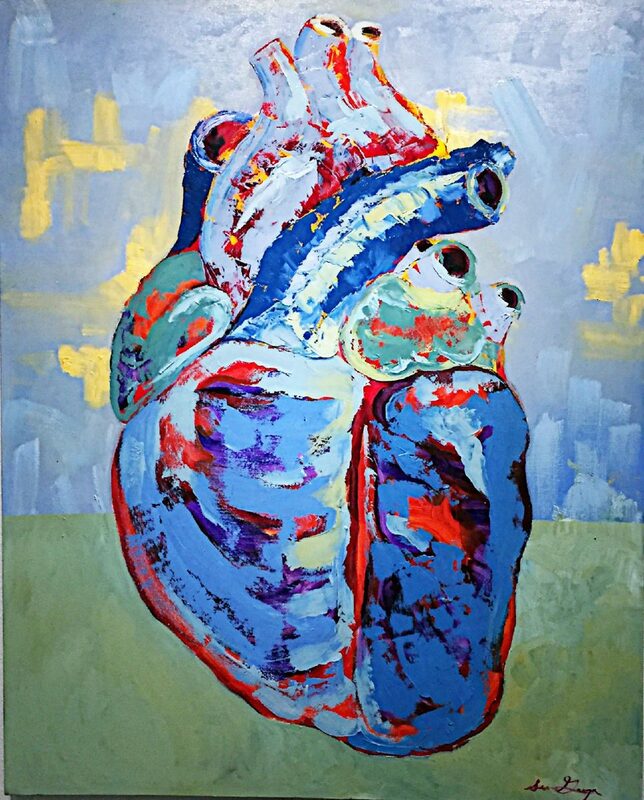 "Blue Heart-You Know Where You Went Wrong" by Sara Garza. Garza’s memories focus on the Spanish bull-fight culture in Starr County. As if to counter the European flavor of Garza’s Spanish emphasis, performance artist Danielle López, engaging in Curanderismo, performed on opening night with a piece celebrating her Nepantla identity and spiritual activism. While Wedgworth’s and Whittemore’s works demonstrate having worked together and shared ideas, Garza’s work has a separate identity. The group statement emphasizes the unifying idea of Valley Cultura, professing a regional aesthetic, and the jewelry and prints reinforce the idea with local references. Garza’s matador and bullfight theme, by itself, does not speak of this regionalism, but rather Spanish colonization, which seems at odds with the tone of this exhibition. 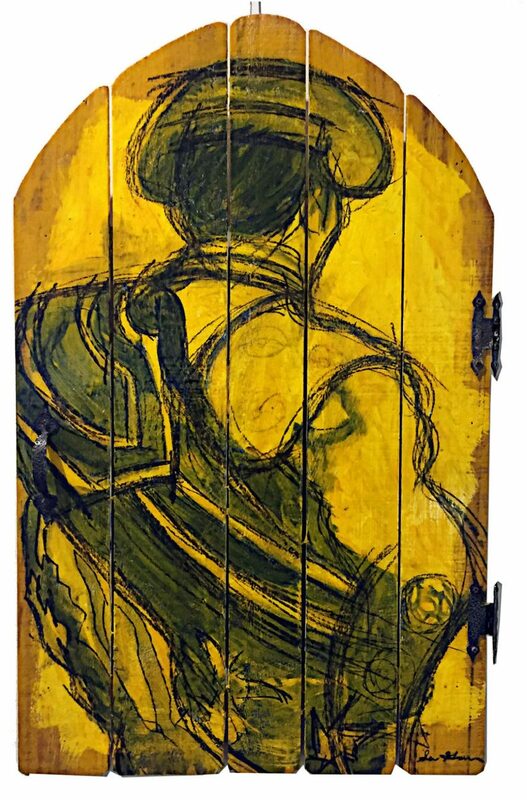 Garza is an impressive painter, and her painting on an old gate, “Montalvo,” is well drawn and has a decorative charm, but emits a conflicting resonance in the overall context of the show. Whittemore’s dye sublimation prints on aluminum and laser decals on travertine reflect and point out her background in graphic design. 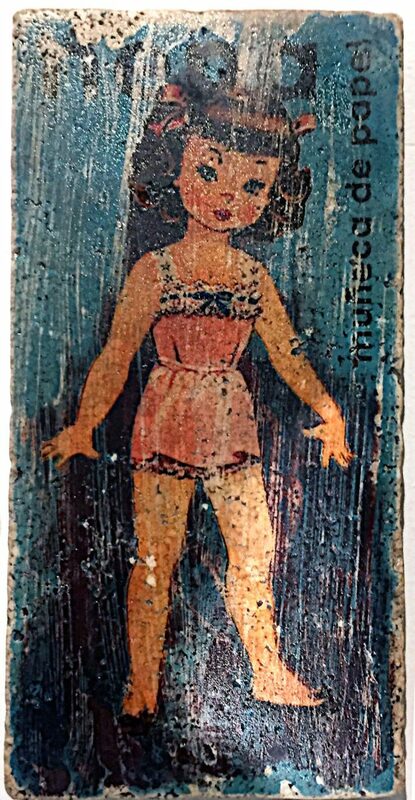 “Por Favor” is scanned from a commercial paper doll with which she played as a child. Although the original is in good condition, Whittemore imposed surface imperfections onto its decades old mid-century design conceit to emphasize its age. “La Llorona” updates the Valley legend with an image of a downtown women’s shop where lifeless mannequins appear in bright colors behind contrasting black lettering and numeration. Other prints by Whittemore combine photographic images into montaged Valley scenes mixed with bilingual text and pumped-up Tex-Mex coloration. 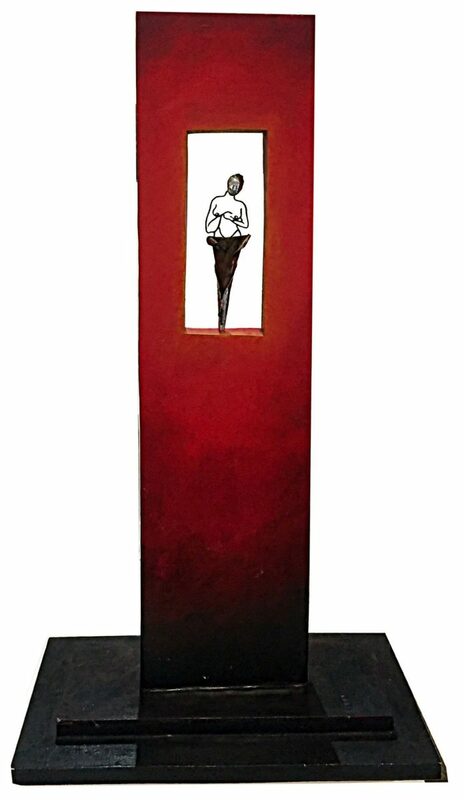 The 3-D portion of the exhibition is presented by Wedgworth; two feminist themed sculptures stand amid wall-displayed jewelry pieces in the form of pendants. Wedgworth is back from a decade-plus break from her jewelry work with a sensitive selection and placement of components. These pieces complement the “Materials and Perspectives” concept with locally sourced materials and the artist’s collaboration with Whittemore. “Untitled” pendant incorporates a Whittemore paper doll print. The jewelry not only incorporates Valley images, but also objects that hold meaning as memory for the artist. This is a fine statement that could have taken this exhibition much further. Perhaps next time?